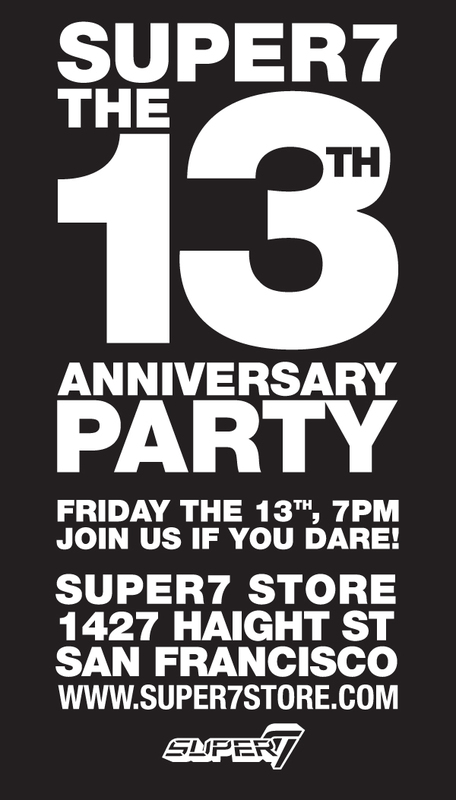 Super7 is celebrating our 13th Anniversary this Friday the 13th! Join us if you dare at the Super7 Store for our Lucky 13th Birthday Party! Come out to the Super7 Store Friday the 13th at 7pm for a trip down the Skullbrain Memory Lane and trade terrible tales of toys that got away, or brag big about bad to the bone scores! Food and Drink will be on hand, along with some super special Super7 Anniversary Lucky Bags, a sampling of the Super7 Historical Toy Archive, and who knows what additional surprises! 7pm, Super7 Store at 1427 Haight St, SF, CA.